Since the beginning of time, people have been making things up. First, the Pilgrims made up that the earth was flat. Then Watson and Crick made up DNA. Also, dinosaurs are clearly made up. Roughly one billion scientific studies are published yearly. It is a well known fact that people are really lazy; therefore, it would be impossible for that many people to go through the amount of work required to complete a randomized control trial. It in fact seems unlikely that even one person could complete such a trial. This provides an explanation of why there are so many contradictory results, like how one year they tell you to put your newborn to sleep on its stomach then the next you’re supposed to put it on its back, so what’s up with that? 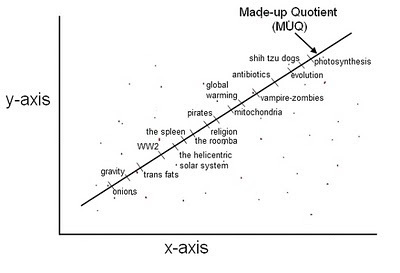 The primary objective of this study is to prove conclusively that all research is made up. Secondary outcome measures include figuring out where all that money comes from to fund all this made up research when there’s a freaking recession going on. 132 “researchers” were recruited for this study from various places. They were assigned to write a one page essay on whatever subject they wanted in one month’s time. Since the average Institutional Review Board (IRB) proposal for a clinical trial must be much longer than one page, the researchers’ inability to complete this much simpler task is evidence that no actual real IRB proposals ever get written. I mean, have you seen one of those things? They’re, like, ridiculous. The inability of even one researcher to write even a single page means that obviously, all research is definitely made up. Alternately, it might be possible that there was one single real study from hundreds of years ago, probably written by Plato or Aristotle or Zeus, and all future studies were plagiarized from that first study. In conclusion, it is clear from our results that all research is actually made up. Or it would be, if we hadn’t made up all our results. how on earth do you get the time to run a blog?!? That's just awesome. I'm tweeting it. I actually quit my job and blog full time now. It is a well known fact that people are really lazy; therefore, it would be impossible for that many people to go through the amount of work required to complete a randomized control trial. I hate to geek out on you for this, but this is actually true! And did you know that drop out -- especially drop out for unknown reasons that could be associated with the outcome -- actually renders the randomization useless, and that all that meticulous data you have is no better than if you just did an observational study. Also, this was really funny. Awesome! I needed this to lighten the morning of reading about glioblastoma derived endothelial cells. Retweeted Dr. Grumpy! 2. I think I love you. this is awesome, I just posted this on reddit. Fizzy your blog is a hit at my medical school, and has lightened several bleary days (weeks, subjects, etc). thanks! Reposted in honor of North Carolina's assembly's ban on science? Heh, I took it down when it got published in JIR, but I figured it's been long enough that I could put it up again. Thanks. I was discussing this article with my husband (a mathematician) last night and he told me outright that he didn't think it was funny. As a research coordinator/project manager, I can completely understand this. My boss does not write anything new. He starts with previous stuff and just edits. I write the IRB, IACUC and Biosafety protocols.